MOSCOW, September 24. /TASS/. Norwegian Ambassador to Russia Rune Resaland was summoned to the Russian foreign ministry on Monday to be presented with a strong protest over the detention of a Russian national in Oslo. «It looks like the wave of a spy hysteria campaign against Russia, including imposed from abroad, is taking on appalling forms in Norway. Naturally, such steps will not remain unanswered,» the ministry stressed. 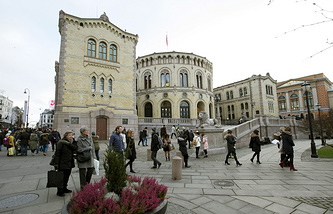 The ministry also said that the consular department of the Russian embassy in Oslo is offering Bochkarev «all possible assistance in protecting his legal rights and interests.».